Michael Lee, a member of the Ewa Beach Limu Project, walked along Oneula Beach on Thursday and collected these different types of limu. A recent court decision denied a permit for constructing a drainage ditch outlet that would discharge storm-water runoff into the ocean off Oneula Beach. Lee said he understands the drainage issue but would rather have a retaining dam there instead of a drainage outlet. 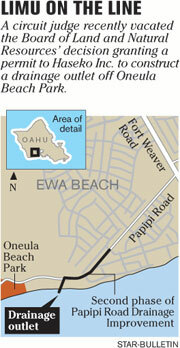 In years past, an abundance of limu -- native seaweed -- regularly washed ashore on the remote sandy beaches of Oneula Beach Park in Ewa Beach. Today, rarely is any found, due to environmental changes and overpicking, according to scientists and cultural experts. And the existing seaweed is reachable only during low tide along the rocky coast. Now the rare marine plant, valued in Hawaiian culture as a source of food and medicine, has taken center stage in a dispute over flooding-mitigation measures. Eileen Hirota, former principal of Ewa Beach Elementary School for 16 1/2 years, recalls wading through knee-deep water in the parking lot after heavy rain; teachers would carry kids piggyback to their parents' cars. "It was really bad," she said. "It would take about two days for the water to evaporate." A developer's proposed response: an $8.1 million storm-water drainage system. The 200-foot-long system would include a concrete headwall and unlined open channel and would incorporate a series of sediment traps, grassy swales or depressions and catch basins that meet city standards, said Sharene Saito Tam, a spokeswoman for the builder, Haseko (Ewa) Inc.
"These measures will help to clean the storm water from Papipi Road before it reaches the ocean, much more so than any of the seven existing ocean outlets that have been in use for that neighborhood for the past several decades," she said. Critics say it will destroy what little limu is left. Opponents of the outlet gained a recent court victory when Circuit Judge Eden Elizabeth Hifo vacated a Board of Land and Natural Resources decision granting Haseko a construction permit. In her ruling for the Native Hawaiian Legal Corp., which represented Michael Kumukauoha Lee of the Ewa Beach Limu Project, Hifo said there is not enough information to conclude that the outlet will not have unfavorable "cumulative effects." The permit application was sent back to the board for more work, stalling the second phase of the project. "We're obviously disappointed that the community has to wait a little longer for the drainage that they've been asking for decades now," Saito Tam said. Lee calls the court's decision a victory for the limu. He said he does not dispute a need for a drainage system, but recommends an alternative that does not have any detrimental effects on marine life. 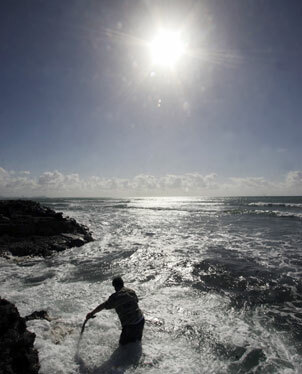 Lee walks along the rocky areas of Oneula Beach looking for and gathering limu. In a contested case hearing last year, the Native Hawaiian Legal Corp. presented alternatives to Haseko's storm-water outfall that included storage and percolation and a vegetated detention basin. The agency also claimed that the developer failed to adequately evaluate several mitigation measures such as grassy swales and an oilwater separator that could reduce the impact of storm-water runoff on coastal waters. Lee said the basin would filter the runoff of any oils and heavy metals. A temporary retention basin is currently set up on five acres of land to address the storm-water runoff for the first phase of the project. Lee said Haseko should make the basin permanent. But Saito Tam said it is not large enough to accommodate the entire drainage system along Papipi Road that stretches from Ewa Beach Elementary to the ocean. More homes are also slated to be built in that area. Greg Hiyakumoto of R.M. Towill Corp., project engineer of the drainage system, said, "The bottom line is that we designed whatever pollutant-control measures we could into the drainage system based on what would be acceptable to the city (Department of Facility Maintenance)." Lee is among a half-dozen people with the Ewa Beach Limu Project who educate students about the need to protect limu as a source of food and medicine and as a cultural resource for native Hawaiians. 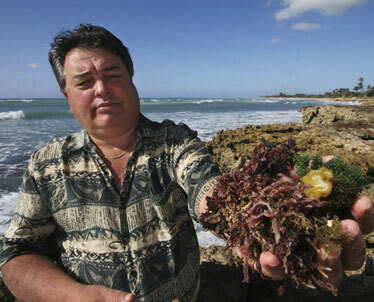 About a decade ago, Lee said, a variety of limu was found off Ewa Beach all year around. "Now it's all bare," he said. Dovetailing the limu decline is a drop in sand crabs and fish, said fishermen Albert Lauro and Teo Tangjian. Marine scientist Brian Lapointe of Florida has said the cumulative impacts of the storm-water runoff at the proposed sites would likely cause the loss of limu species, coral and invertebrates such as sea urchins and anemones. Others disagree. In a 2006 study, Michael Foster of Moss Landing Marine Laboratories, based in California, concluded that the impacts on the limu from the drainage outlet would be insignificant. As the issue goes back to the board, longtime residents emphasized the need to resolve flooding problems along Papipi Road. Area resident John Higgins said about a foot of rainwater typically floods his lawn during heavy rainfall. Higgins said he does not believe a retention basin is a good idea because of the potential for mosquito breeding in the standing water.